Biography Ronald Reagan, 40th President of the U.S.
Ronald Wilson Reagan (Feb. 6, 1911–June 5, 2004) was the oldest president to serve in office. Before turning to politics, he had been involved in the movie industry not only through acting but also through serving as the president of Screen Actors Guild. He was the governor of California from 1967 to 1975. Reagan challenged Gerald Ford in the 1976 presidential election for the Republican nomination but ultimately failed in his bid. However, he was nominated by the party in 1980 to run against President Jimmy Carter. He won with 489 electoral votes to become America's 40th president. Known For: 40th president of the U.S., who led the country during the height of the Cold War. Also Known As: "Dutch," The "Gipper"
Notable Quote: "Every time the government is forced to act, we lose something in self-reliance, character, and initiative." Reagan was born on Feb. 5, 1911, in Tampico, a small town in northern Illinois. He attended and graduated from Eureka College in Illinois in 1932 with a Bachelor of Arts degree. Reagan began his career as a radio announcer that same year. He became the voice of Major League Baseball. In 1937, he became an actor after signing a seven-year contract with Warner Brothers. He moved to Hollywood and made about 50 movies. Reagan was part of the Army Reserve during World War II and was called to active duty after Pearl Harbor. He was in the Army from 1942 to 1945 rising to the level of captain. However, he never took part in combat and remained stateside. He narrated training films and was in the Army Air Force First Motion Picture Unit. Reagan was elected Screen Actors Guild president in 1947 and served until 1952 and again from 1959 to 1960. In 1947, he testified before the House concerning Communist influences in Hollywood. From 1967 to 1975, Reagan was the governor of California. Reagan was the obvious choice for the Republican nomination in 1980. George Bush was chosen to run as his vice president. He was opposed by President Jimmy Carter. The campaign centered on inflation, the gasoline shortage, and the Iran hostage situation. Reagan won with 51 percent of the popular vote and 489 out of 538 electoral votes. Reagan became president as America entered the worst recession in its history since the Great Depression. This led to the Democrats taking over 26 seats in the Senate in 1982. However, recovery soon began and by 1984, Reagan easily won a second term. In addition, his inauguration brought an end to the Iran Hostage Crisis. More than 60 Americans were held hostage for 444 days (Nov. 4, 1979–Jan. 20, 1980) by Iranian extremists. President Carter had attempted to rescue the hostages, but due to mechanical failures the attempt was unsuccessful. Sixty-nine days into his presidency, Reagan was shot by John Hinckley, Jr., who justified the assassination attempt as an effort to woo Jodie Foster. Hinckley was found not guilty by reason of insanity. While in recovery, Reagan wrote a letter to then-Soviet Leader Leonid Brezhnev hoping to find common ground. However, he would have to wait until Mikhail Gorbachev took over in 1985 before being able to build a better relationship with the Soviet Union and ease tensions between the two nations. Gorbachev ushered in an era of Glasnost, greater freedom from censorship and of ideas. This brief period lasted from 1986 to 1991 and ended with the fall of the Soviet Union during the presidency of George H. W. Bush. In 1983, the U.S. invaded Grenada to rescue threatened Americans. They were rescued and the leftists were overthrown. Reagan was easily elected to a second term in 1984 after running against Democratic challenger Walter Mondale. Reagan's campaign stressed that it was "Morning in America," meaning that the country had entered into a new, positive era. One of the major issues of Reagan's second administration was the Iran-Contra scandal, also called the Iran-Contra Affair, or just Irangate. This involved several individuals throughout the administration. In exchange for selling arms to Iran, money would be given to the revolutionary Contras in Nicaragua. The hope was also that by selling arms to Iran, terrorist organizations would be willing to give up hostages. However, Reagan had spoken out that America would never negotiate with terrorists. The Congress held hearings delving into the Iran-Contra scandal in mid-1987. Reagan eventually apologized to the nation for what had happened. Reagan completed his term on Jan. 20, 1989, after several important meetings with Soviet leader, Premier Mikhail Gorbachev. Reagan retired after his second term in office to California. In 1994, Reagan announced that he had Alzheimer's Disease and left public life. He died of pneumonia on June 5, 2004. Reagan's largest significance was his role in helping to bring about that downfall. His massive buildup of weapons, which the USSR could not match, and his friendship with Gorbachev helped usher in a new era of openness which eventually caused the breakup of the USSR into individual states. His presidency was marred, however, by the events of the Iran-Contra Scandal. 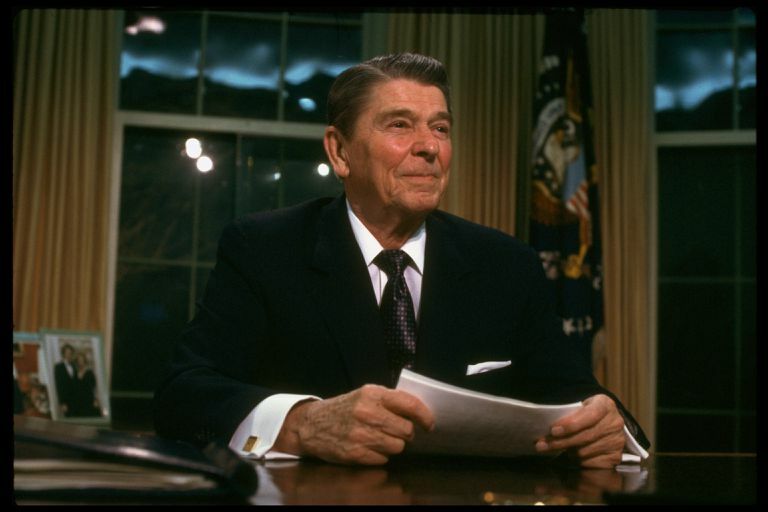 Reagan also adopted an economic policy whereby tax cuts were created to help increase savings, spending, and investment. Inflation went down and after a time so did unemployment. However, a huge budget deficit was created. A number of terrorist acts occurred during Reagan's time in office. For example, in April 1983 an explosion occurred at the U.S. embassy in Beirut. Reagan claimed that five countries typically harbored aided terrorists: Cuba, Iran, Libya, North Korea, and Nicaragua. Further, Muammar Qaddafi of Libya was singled out as the primary terrorist. Editors, History.com. “Ronald Reagan.” History.com, A&E Television Networks, 9 Nov. 2009. “ ‘Morning in America.’ ” Ushistory.org, Independence Hall Association.